In March, 1899 (exactly one year after his discovery of the cache tomb of Amenhotep II) Victor Loret ordered his workmen to make a series of sondages in an area of the Valley of the Kings between the tombs of Tuthmosis I (KV 38) and Amenhotep II (KV 35.) He eventually uncovered a shaft, approximately twenty six feet deep, with a small chamber cut into one side. Loret descended the shaft, entered the chamber, and made another remarkable find: the first essentially intact tomb ever found in the Valley of the Kings. Inscriptional evidence indicated that the small tomb (KV 36) belonged to a man named Maihirpre. His funerary equipment constituted the most complete assemblage of such objects found in the Valley up to that time, and would remain so until Theodore Davis discovered the tomb of Yuya and Tuyu in 1905. Obviously of 18'th Dynasty derivation, the exact date of the burial is still disputed, and evidence from the tomb can lend support to several different dating schemes. A linen wrapping found on Maihirpre's mummy bears the cartouche of Hatshepsut. (Click here to see photo of linen wrapping.) Influenced by the presence of this cartouche, Steindorff speculated that Maihirpre might have been a companion of Tuthmosis I, Hatshepsut's father. Quibell also based his conclusions on the Hatshepsut cartouche (as well as on pottery considerations) but argued that the tomb should be dated to the time of Tuthmosis III, and Daressy accepted Quibell's dating in his Fouilles. Today, some researchers believe that the linen wrapping with the Hatshepsut cartouche was a kind of antique, old in Maihirpre's lifetime, because other objects in KV 36 clearly point to periods later than that of the female Pharaoh. One of these, a beautiful glass vase, has been dated to the reign of Amenhotep II on stylistic grounds. (Click here to see photo of vase.) In his 1908 Guide to the Cairo Museum, Gaston Maspero also dates Maihirpre's burial to the reign of Amenhotep II, a view which was shared by Hayes, G. E. Smith, and Cyril Aldred. However, Maspero changed his mind in the 1915 edition of his Guide, in which he dated KV 36 to the time of Amenhotep III, a date which was also accepted by Rex Engelbach. 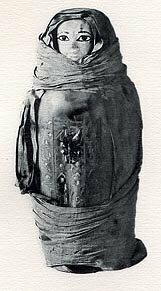 Maspero probably based his view on a consideration of the box and loincloths of Maihirpre found along with a fragmentary box of Amenhotep III in 1902 by Howard Carter. 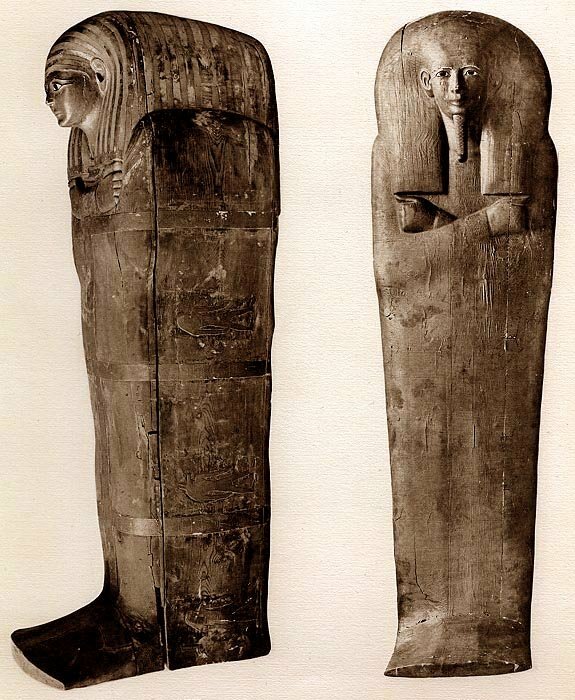 Maihirpre's coffins, sarcophagus and canopic equipment (see below) bear a close stylistic resemblance to the funerary ensemble of Yuya and Tuyu, and would also seem to derive from sometime during the reign of Amenhotep III. C. N. Reeves dates KV 36 to the time of Tuthmosis IV, a view also held by Alfred Lucas and his reviser, J. R. Harris. Never properly published by Loret, the only account of the discovery written while the objects were still in situ within KV 36 was penned by Georg Schweinfurth, a botanist, and appeared in the popular German magazine Vossische Zeitung on May 25, 1899. Three years later, Georges Daressy published photographic plates of the mummy and the tomb's contents in his Catalogue General des Antiquites Egyptiennes du Musee du Caire: Fouilles de la Vallee des Rois ([Cairo, 1902,] pp. 281-298) and this long out of print book has remained the only extensive photographic record of the find ever published. Unless otherwise indicated, the photographs of Maihirpre and his funerary equipment used on this website are from Daressy's work. They provide a valuable visual record of an important Egyptological discovery that has been largely forgotten by the general public today. 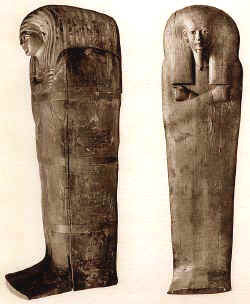 Maihirpre's mummy (at right and above) was found resting in a nested set of two coffins contained within a large rectangular wooden sarcophagus. Schweinfurth reported that thieves had removed some of the bandages from the mummy, and his statement was confirmed by Daressy, who added the detail that large sections of bandages had been cut with a sharp instrument which had been applied with particular force to the bandages of the legs. Reeves dates this illicit activity in Maihirpre's tomb to the Ramesside period based on the evidence of 20'th Dynasty ostraca found in the vicinity of KV 36 by Howard Carter in 1902. 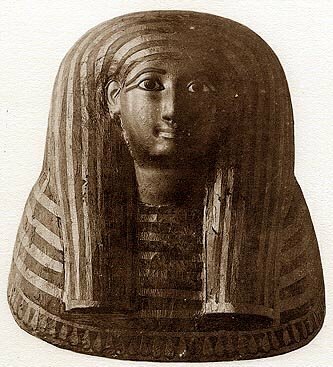 In spite of its ill-treatment by tomb robbers, Maihirpre's mummy retained its cartonnage mummy mask and still had about a dozen different articles of jewelry in place among the tattered bandages or lying loose in the coffin. Among these were bracelets, collars, plaques, and a scarab. The embalming incision was still covered with a plain gold plate which the thieves had also managed to miss. The mummy itself, which was unwrapped on March 22, 1901, was very well preserved. According to Daressy, Maihirpre was a young man when he died, probably not much over 20 years of age. Dennis Forbes reminds us that Daressy was not a trained anatomist and that his estimate of Maihirpre's age at death is "certainly not expert opinion." However, it seems evident that Maihirpre was far from being elderly. The fact that his teeth are only mildly worn is a good indication of a young age at death. The ancient Egyptian practice of mixing grain with sand and grit in order to aid the grinding process produced a kind of bread that was dentally abrasive and able to wear down the teeth in relatively short order. Maihirpre's mummy measures 5 feet, 4.75 inches and his skin is dark brown. 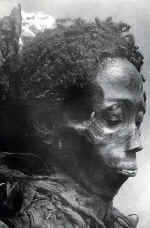 Daressy believed that this skin color is not the result of chemical reactions with the embalming materials, and most writers contend the Maihirpre was at least part Nubian. The curly hair which is so visibly prominent on the mummy's head would initially seem to confirm Maihirpre's Nubian ancestry, but is in fact a very realistic wig glued securely in place over his shaven scalp. Maihirpre's ears were pierced, and he was uncircumcised. No wounds or obvious signs of illness appear on his body that might help to indicate the cause of his death, but, as Dennis Forbes points out, Maihirpre has never been examined by an experienced anatomist. The skin was missing on the soles of his feet, but this probably occurred during the embalming process. Maihirpre bore several important titles. He was referred to as a "child of the k3p," a title normally used to designate a foreign prince who had been raised from an early age in Egypt. This practice, which came into vogue during the New Kingdom, helped to cultivate a sense of loyalty toward Egypt in the children of vassal-state rulers. He also bore the important title "fanbearer to the king" and was one of the earliest people to hold this designation. Dennis Forbes points out that this title was often held by the Viceroy of Kush himself. Maspero speculated that Maihirpre may have been the son of Tuthmosis IV or Amenhotep III and a Nubian concubine, but no hard inscriptional evidence supports this. It is hard to imagine a son of the Pharaoh, even by a lesser concubine, who would not unambiguously proclaim his half-royal parentage in one of his personal titles. Maihirpre's mummy mask, made of cartonnage, displays features which date it to the reign of either Amenhotep II or Tuthmosis IV. It lacks the feather/wing decorations which characterize mummy masks of the early 18'th Dynasty, but has not evolved the graceful lines and proportions seen in later masks from the time of Amenhotep III. It is striped in black resin and gold foil which repeats the decorative scheme of Maihirpre's outer coffin. The eyes are of inlaid black and white stone. Maihirpre's middle coffin (at left in photo) had its gold foil decoration in place but was never given its coating of black resin. The absence of the resin indicates that the Egyptians may have applied it to such coffins only when they were in place in the tomb. This coffin was left unfinished because it was found to be too small to contain the inner coffin of the set. It was found, unused and overturned, on the floor in the middle of the tomb. The inner coffin (at right in photo) is completely gilded. Unlike the more ornate gilded inner coffins of Yuya and Tuyu, this coffin has hands crossed over the chest but does not have stone inlays. The decorations are cut into the gilded plaster. 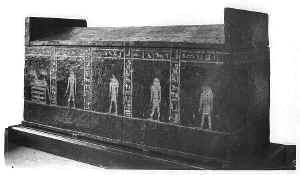 Maihirpre's large wooden sarcophagus, measuring over 9 feet in length, is coated with black resin and decorated in gold foil. Anubis and the Four Sons of Horus line the sides. Isis appears at the foot end. The decorative scheme mirrors that used on high status coffins of the period. 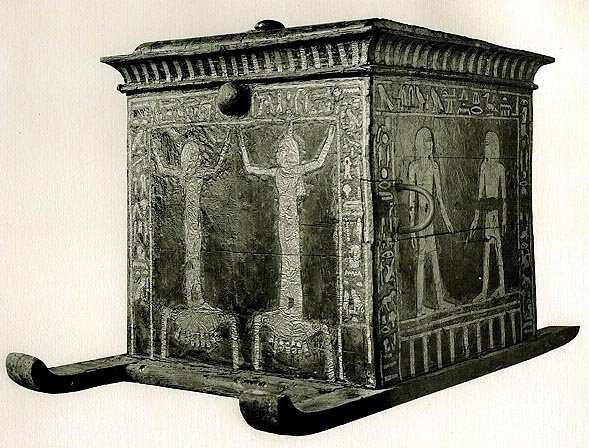 Isis, Nepthys, and the Four Sons of Horus, depicted in gold foil, guard the canopic chest of Maihirpre. The use of gold on the chest is another indication of Maihirpre's high status. Most non-royal canopic chests of this period were decorated with yellow paint. The per wer shaped lid with cornice is similar to that used on Tutankhamen's calcite canopic chest. Maihirpre's four calcite canopic jars do not match. Two have very traditional stoppers with large-faced, human heads, but the other two have human headed stoppers with smaller, more delicate features. The jars with the smaller-faced stoppers--one of which is seen at left--possess an unusual, doll-like quality. Human headed canopic jars were common until the 20'th Dynasty, when animal heads, used to represent three of the Four Sons of Horus, became the vogue. All four of Maihirpre's canopic jars were inscribed with protective spells and wrapped with linen.